An 18-hole FootGolf course is available at Pine Brook Golf Course. Play is available daily starting at 12 p.m. Learn more about our FootGolf offerings. 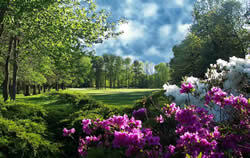 Pine Brook is an 18-hole, par 61 executive-length golf course with golf center. Snacks and refreshments are available through vending machines. Pine Brook measures 4,168 yards from the white tees and includes one par 5 hole, five par 4 holes, and twelve par 3 holes. Pine Brook has a USGA course rating of 59.8 and slope rating of 93 from the white tees. 2012 brought the designation of Pine Brook as the Park System's first junior-friendly facility with an additional set of forward tee markers and an adjusted score card. Children's rate (12 and under) of $7 is available daily at matinee times with a paid adult. Tee times are available through the tee time reservation system after the purchase of a Monmouth County Resident ID card or a Non-Resident Reservation I.D. Card. Reserve a tee time online or call 732-758-8383. Non-card holders can make tee times reservations by calling the golf center or in person, no more than two days in advance of play. Pine Brook Golf Course now features an 18-hole FootGolf course. Play is available daily starting at 12 p.m. The cost is $12 per person age 13 and up and $9 per person age 12 and under. Bring your own ball or rent one of ours for $2.50. Call the Golf Center for more information. State Hwy. 9 northbound to Covered Bridge Blvd, Manalapan (north of Tennent Rd.) Make U-turn onto Hwy. 9 south; stay in right lane and turn right onto Covered Bridge Blvd. Follow to Course. Route 18 to exit 30, Hwy. 9 south. Follow Hwy. 9 to Covered Bridge Blvd; turn right and follow to Course.